I am sure by now your email account is being flooded by emails from different businesses and companies telling you that their privacy and security information has been updated. In some cases you have to go to the site and give permission for them to continue using your email and personal information or that if you do nothing they will either remove you from their emailing list/data base or by not doing anything you accept their new terms. It is a new General Data protection regulation law from the EU which goes into law and effect tomorrow (25th May 2018). 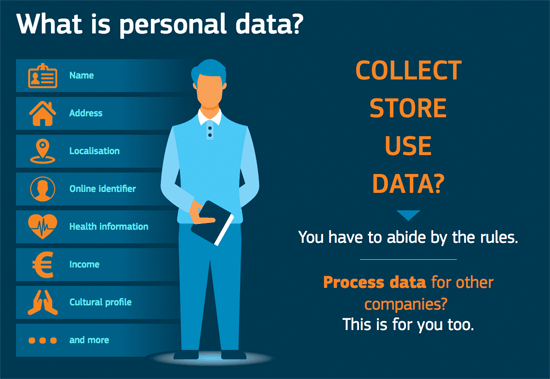 In simple terms, it is an updated law to provide better transparency for users about how their personal information is being collected and how it is being used and why it is being collected or used. You may notice that you are getting emails from certain companies or brands that you hadn’t even signed up for? That can be because a company you have signed up for have sold your information to another company and they have added you to a mailing list. Or maybe you went into a site and clicked on some button to get to the actual blog or recipe or website, only to realise you have accidenly signed yourself up to a mailing list…. But from tomorrow, that won’t be ok. Instead websites and companies need to be transparent with things like that… when you tick a box or sign up for a mailing list there needs to be information about what personal information is being used and why it is being used. From tomorrow if a company or business or website is found to have personal information where there is no consent given they can be fined a huge sum. Basically it is a hassel for alot of companies right now and nobody really knows how the law will go into effect or what the consequences may be…. but people will learn. However i realized that this law also applies for bloggers. (Good thing i realized this 1 day before the law goes into effect). HOWEVER it applies more for bloggers who may have an email listing or send out a weekly/monthly email to subscribers. I don’t have an email listing and i don’t earn money from my blog and i don’t have any saved personal information. HOWEVER the site i am using to blog on – wordpress has cookies which they store on your site, and you can read more about the cookies (what information is collected, stored and why) HERE. So that might be a good idea if you are intersted, however know that whenever you visit any website or blog there will be cookies stored on your computer and some form of data collected. I don’t know much about this new law or how much it applies to me, however for my own safety i am going to leave this disclaimer below which is adapted from Miss Marzipan. Also note, when you choose to subscribe to my blog via email then you choose to sign up to recieve a notification via everytime i post. You can however unsubscribe from that email list at the bottom of your email. I do not have anything to do with that email list, and it is a choice you have made yourself – however, you can always unsubscribe and choose to just click in on my blog everyday or week instead. I am also choosing to turn off personalized ads on my blog which are ads that i personally have no control over what is shown, but they are personalized based on cookies that are stored on your site from previous searches you have done or websites you have choosen. So instead the ads on my website will just be random ads and not personalized to you. If for whatever reason you do not consent to the above, please don’t leave a comment or send me a message via the contact form on my blog. However know that i do not store any personal data and the only personal data i have is the email you share via the comment section/contact formula and your IP adress, and when you press the “comment” button you choose to accept that you are ok with giving that information to my blog. If you have any questions just send me a message… or just send me a DM on IG i guess hahah. Still so unsure with this new law and what it means for bloggers, but better safe than sorry and of course to be open and transparent. But i guess as i don’t really have any personal information about any of you and i don’t market anything to you or try to email or sell you things based on personal information that i might have gotten. I guess i’ll just wait and see. I know there is a register that all companies/websites need to register and pay every year – so will have to see whether it applies to hobby bloggers as well. Thank you for explaining this – I didn’t really know what all this Data stuff was about but I know I`m getting lots of e mails in my account all of a sudden! Wow, that is such an informative and professional post. Thank you!